Dinosaurs are super cool, but there are some places where dinosaurs don’t belong, and one of those is in your fast-paced DevOps environment. We’re in a new world where traditional security solutions no longer make the cut. Software is increasingly complex, and when deployed at the speed of DevOps, it creates a new type of risk: Software Exposure. Legacy application security tools are too big, too slow, and too clunky to deliver the innovation needed to protect your customers in the 21st century. The Software Exposure Platform from Checkmarx is an entirely new species heralding the next generation of software security. The platform builds security in from the beginning, supporting all stages of the software development lifecycle, allowing enterprises to deliver secure software at the speed of DevOps while mitigating their business risk. 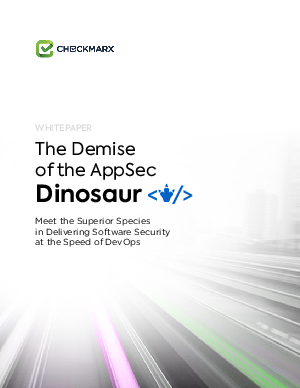 Download the white paper The Demise of the AppSec Dinosaur to learn how Checkmarx provides the combination of integrations and automation required in fast-paced development environments to empower development and security teams to improve the overall security posture of their organizations.